What is the Meta Title and Meta Description? The Metadata allows Google and other search engines to quickly access the most important information about the pages of your website. The Metadata allows Google and other search engines to quickly access the most important information about the pages of your website. The 'Metadata' (or SEO Title and Description), is one indicator used by Google and search engines to identify the content to display on the Search Engine Results Pages (otherwise known as the SERP’s). This is exactly the reason why you shouldn’t ignore them. The indicators in red show the section where the Metadata displays from the keyword used in the search. The Meta Title, URL and Meta Description showcase the page where you can find the exact information you're looking for based on the keywords you've used in your search. In this example, we used 'google search console' as our keyword. Note the term 'search console' appears in Bold within the description as well. Ideally, use your Google Analytics, Adwords and Search Console data to review your ‘most searched terms’ used by visitors to your website. These keyword terms are your ‘gold dust’ and should be added to your focus keyword list. Recent Reviews and Testimonials from clients are a perfect source of keywords after all these are their words, the language of your customers. 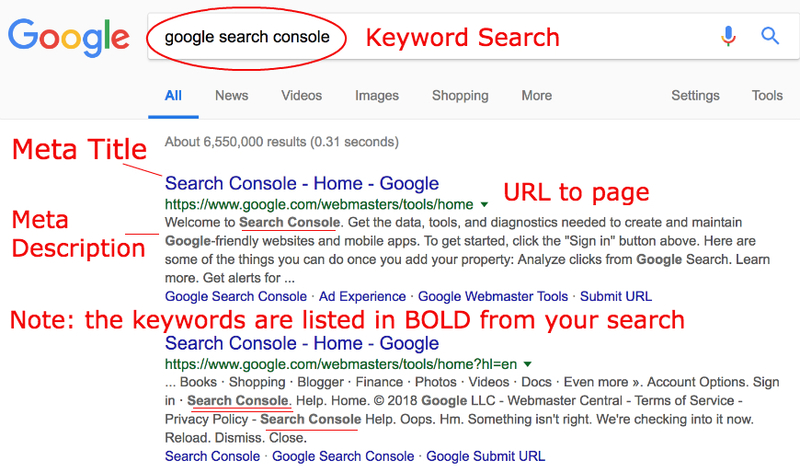 You can now write your SEO Title and Meta Description to fit perfectly within the results section displayed by Google, as per the image above. Use your focus keyword in all sections if possible, however, it’s not mandatory. Although Google is testing longer characters numbers for the Meta Description we recommend you stick to the 56 - 60 characters for the Title and the 156 - 160 characters and your Meta Description. Our initial steps for all Intensive SEO clients is to identify the most used and search for keywords - the 'gold dust' terms your potential clients use to find you online. Once we have a list of keywords to share with you, we'll edit this to your requirements and request you sign off the final Keyword Plan list. Once the keywords are approved we use this list to identify a focus keyword per page of the current website. The main Menu pages are typically the first set of Metadata we produce, however, if there are specific pages within the site which have high performance and visitor numbers we can include these in our initial pass of Metadata. The Meta Title is the most impacting and important part of the Meta. Changes to the Title will affect the SEO visibility and ranking. The Description is focussed more to entice the user to click through to the website.